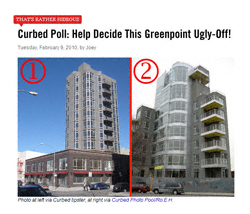 Quicklink: The Great Greenpoint Ugly-Off! I’d be ashamed to be seen entering either one, but have to give the Eye Damage Award to 524 Manhattan — because it looks like Harry was serious, while we all know Karl scribbles his designs in his sleep, as therapy, hoping to transfer his nightmares to the world at large. I couldn’t have said it any better myself. Point, click and vote fellow Greenpointers!